When I wrote in 2016 that “there will be no Brexit” – or that there would be a Brexit so similar to actually staying in the EU it could be called the No Brexit Brexit – I was thinking not of the next outbreak of political giddiness, but of more fundamental truths. Perhaps the greatest of these, was that the better nature of the British would prevail. Because all we have been seeing, in essence, is a nation struggling with the dark side of its character, the way that any individual would struggle in certain circumstances. Brexit, for a start, did not mean Brexit – whatever that was supposed to mean. Brexit really had very little to do with the EU at all. It was about immigration, or about the fears drummed up about immigration by bad actors, of whom there are many in the real and the virtual worlds. In its rawest state, it was about “bloody foreigners” in general, with the EU being put in front of voters as the perfect manifestation of all this bloody foreignness – since the EU did seem literally foreign, in that Britain was always somewhat disconnected from it, to vote against it must have seemed like having a free shot at this imagined enemy. A shot that you probably wouldn’t regret, indeed if you were to believe the lies of the bad actors, it would be the best thing that John Bull had even done. But Brexit was never a good idea, because it was never an idea at all. It was little more than an eruption of the curse of nationalism which has visited many countries since the Great Recession. And this is why it could never bring anything but chaos and degeneracy, because nationalism is not a policy, as such. It is not a strategy, or a constructive alternative, it is more a toxic energy. Its malign influence can now be seen even in the game of football which at one level is being dominated by Premier League sides who are full of “bloody foreigners” – but which has recently given us English players such as Raheem Sterling and Danny Rose making strong statements about the racism which is routinely directed towards them – and not just by hooligans at the grounds. There are hooligans in the media too, in the same organs which have been pushing this nationalist poison for a long time. And since nationalism will always carry the implication that other nations are somehow inferior, it has no trouble seguing into the sneaky abuse of black men such as Sterling and Rose, into old-school racism. But the bad actors have a problem here too, and it is this: in the UK, there’s just not enough of them. They got lucky for one day in June 2016, and they know it, which is why they would hate another referendum. Because they would lose. And the reason they would lose, is that Britain may be struggling with this dark side of its character, as represented mainly by the Conservative Party – struggling horribly indeed. But eventually it will prevail over it. “Following the precedent of almost all immigrant communities in Britain – from the German steelyard workers of the 16th Century to the Spitalfields Huguenots to the Ashkenazi Jews of east London, Manchester, Liverpool and elsewhere – it was perfectly natural for south Asians and Afro-Caribbeans to cluster in communities where food, language and faith softened the shock of uprooting. The astonishing miracle, generations on, is that this experiment has been so successful, with south Asian and Afro-Caribbean Britons prominent in every walk of life from education to broadcasting, sport and the professions, as well as business and technology. Given that this is indeed an astonishing miracle, an astonishing tribute in general to the greatness of the nation which performed it, the other astonishing miracle is that the tribe of white nationalists has managed to push it so far, to force this conflict between these better instincts of the British, and the bad-minded buffoonery offered by Farage and the Tories. So as they struggle with their dark side, you can deduce that one of the reasons the Brits have been so grossly incompetent in “delivering Brexit”, is that on the whole, they don’t really want it. Even the ones who think they should want it, for abstract reasons to do with “the will of the people”, don’t really want it, because they know that in truth it is not the will of the people – so they are like the horse that keeps galloping towards the fence and then “refusing”. 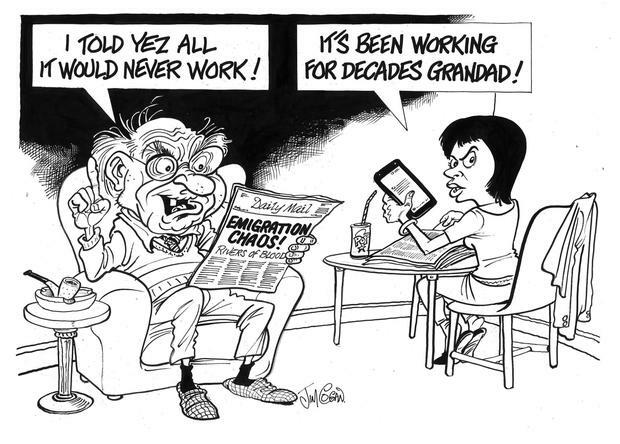 The deadlock in the House of Commons dramatises this duality – but while we may be inclined to laugh at it, after what we saw at the Oireachtas Committee last week, we may laugh no more. Still I believe they will find a way out of Brexit, for the same reason that I have always felt they would find a way out of it. The report on the RTE radio lunchtime news by Ciaran Mullooly was describing how Mark Dalton, a former Dail assistant and member of Kildare Co Council, had pleaded guilty at Naas Circuit Court to 14 counts of theft and 14 counts of forgery. About €200,000 had been misappropriated from a housing association. I knew the next part before Mullooly said it – Dalton had developed a gambling addiction. I mean, I didn’t know it for sure, but I was guessing there was roughly a 100pc chance that would be the next part, and so it was. Indeed, these days if I hear a report about a man stealing a large amount of money from some institution to which he had access, and they make no mention of a gambling addiction, I start to think that they must have made a mistake – that they just don’t know about it yet. Other aspects of the report were also routine – there was no evidence of an extravagant lifestyle and Mr Dalton had no previous convictions. Indeed it should now be well known that addicted gamblers are too busy gambling to have any kind of a lifestyle other than a gambling one. But for all its predictability, there were a couple of odd aspects to this one. It featured the forgery of the signature of Ceann Comhairle Sean O Fearghail, who was entitled to sign cheques drawn on the housing association account. Yes, I think this was the first mention of a Ceann Comhairle in any of these dispatches. And then there was the fact that the former Minister for Finance Charlie McCreevy had written to the court on behalf of Mr Dalton, who now attends meeting of Gamblers Anonymous. Which was decent of McCreevy – I’d hold the view that if you can’t offer some such assistance to a man in that kind of trouble, as a member of the human race in general you should consider your position. Yet there was an irony here, in that as a minister McCreevy was a great man for slashing the betting tax. As a young punter himself he would have paid tax of 20pc in the turf accountant’s office, which was not just a way of raising revenue, it was an official statement that gambling was something which should be made slightly difficult – and this was a time when it was far more difficult to get your hands on, say, 200 grand of other peoples’ money, if you were so inclined. Now there is virtually no betting tax, in a world in which you can quite easily ruin your life and those of a few other people, in the course of a long weekend. I don’t know if McCreevy would now approach this matter in a different spirit… but again I could take a pretty good guess. The response to the various fundraising projects for Sean Cox has been tremendous, and it has confirmed this deep connection between so many Irish people and Liverpool Football Club. There are obvious and practical reasons for this due to the amount of citizens in Liverpool who are from Ireland originally, but there is also some sort of mystical element to it. Football can do that, it can make you form deep attachments which make complete emotional sense to you, while those who are more literal-minded can be heard cribbing about the illogicality of supporting “11 millionaires running around a field in a foreign country”. Today our 11 millionaires face Chelsea’s 11 millionaires – and frankly given their efforts on our behalf of late, we are concerned only that Virgil van Dijk or Roberto Firmino or Mo Salah are not being paid nearly enough. We are in a very strange place, we Liverpool fans, because with five games left in the league we know no peace – and yet we are also profoundly happy at the way these outstanding men have put us in a position to compete for the title. Our days are filled with anxiety, but it is the best anxiety we have known since the last time it happened – in 2014, when we were done out of it by what can only be described as… Chelsea. I would not mention this today, except I think that you would agree that it is better to speak of one’s worst imaginings – and to note that in 2014 we were also done out of it by Crystal Palace, and that our rivals Manchester City are today playing what can only be described as… Crystal Palace. There will be more days like this, for the multitudes in Ireland and in many lands, until there are no more days, and the truth will be apparent to all.